Seven had a shocker on Monday January 1 this year. Its next lowest Monday share came last night. The 7pm slot was the only slot over half a million after 7pm last night, just days after a rallying call from Kennedy Award winner David Richardson, who wants the primary channel to go into battle with Nine with a national current affairs product. But it’s later in the night Seven would perhaps rather be kicking goals in its 2018 second half. 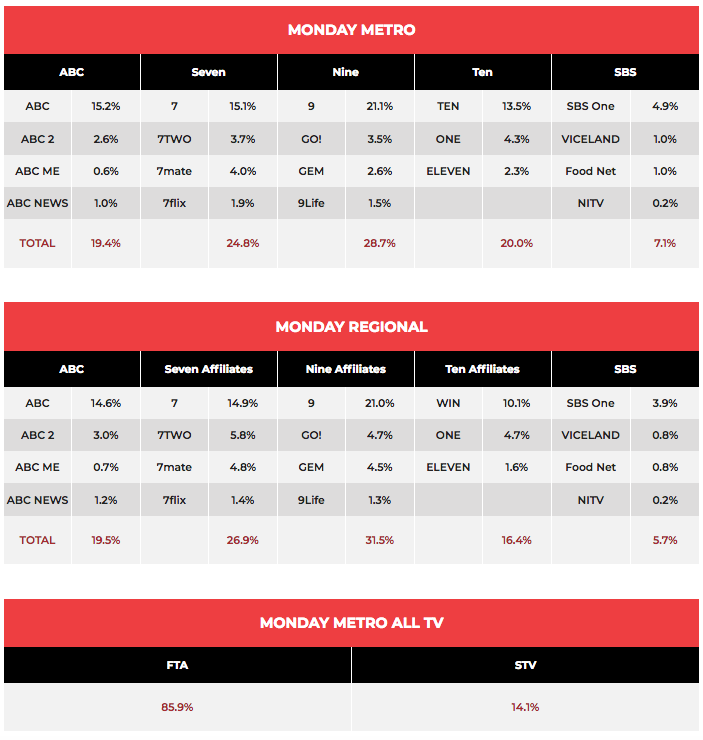 After a week 32 average audience of 656,000, the daily soap Home And Away launched into a new week on 664,000. Dance Boss started its second week on just 479,000 after a disappointing launch audience of 599,000 a week ago. Ramsay’s 24 Hours To Hell And Back grabbed the 8.30pm timeslot with 314,000. The Single Wives featured the last dates but the show had drifted later and started close to 10pm with 132,000 watching. Troublesome neighbours and cosmetic surgery were two of the topics on the first A Current Affair of a new week. The week started on 880,000 after a week 32 average audience of 767,000. Wallpaper and penthouses were among the talking points as The Block got into another week of renovation on guest bedroom week. Expect walk-in robes, king-sized beds and apparently even a library! 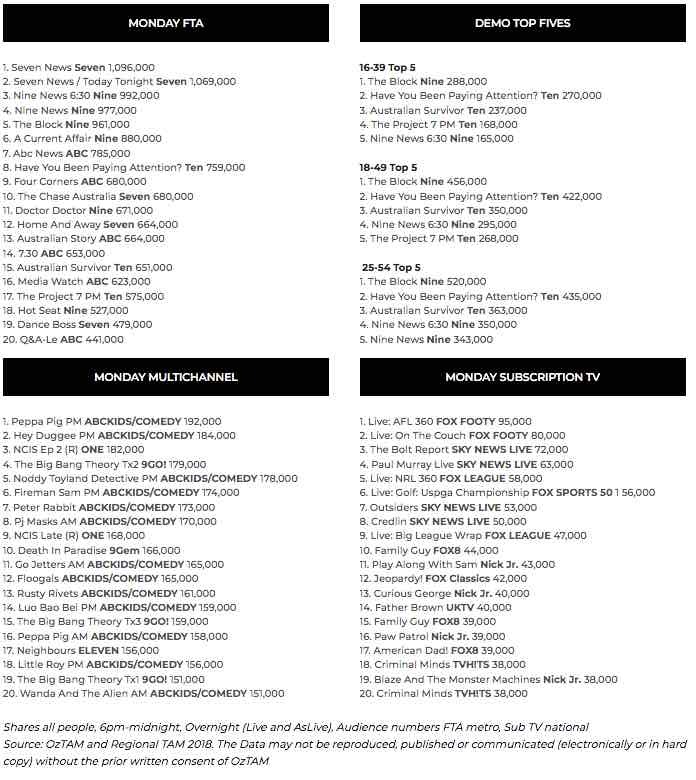 The Monday episode did 961,000 after 1.13m a week ago. The second episode in the new season of Doctor Doctor then did 671,000 after launching with 720,000 last week. 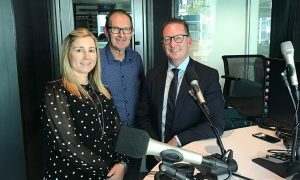 Footy Classified did 174,000 across three markets with 118,000 in Melbourne. After a challenging Sunday share, the channel lifted off the back of Survivor and Have You Been Paying Attention? Pointless did 277,000 after a week 32 average of 249,000. The Project then did 296,000 after 6.30pm, climbing to 575,000 after 7pm. Benjamin Law and 5SOS were Monday guests. Australian Survivor contestant Tegan has become the first person voted to Exile Beach. “WTF,” she mumbled last night when the result was read out in what was an intriguing episode. After 592,000 on Monday last week, the audience last night lifted to 651,000. Has what might have been once referred to as the Have You Been Paying Attention? B team become the A team? A very solid performance last night saw regulars Ed and Sam joined by Urzila Carlson, Anne Edmonds and Dane Simpson and the audience loved it, lifting the show’s numbers week-on-week from 660,000 to 759,000. Street Smart has been moved to after HYBPA?, which should have provided a better audience. The second episode, however, did 244,000, down from 356,000 at 8pm Sunday just over a week ago. Australian Story was on 664,000 with an unsettling reminder of the Kathleen Folbigg story. She is serving a 30-year prison sentence for killing all four of her infant children. Four Corners then looked at the cosmetic surgery industry with reporter Louise Milligan looking at doctors and their medical practices that are making them social media stars. The episode did 680,000, which is a turnaround from 517,000 last week. Media Watch then did 623,000 followed by Q&A on 441,000. Inside Windsor Castle pushed higher to 331,000 for episode three. The final episode of Get Fit Fast lowered the audience to 142,000 before an improved 180,000 tuned in for 24 Hours In Emergency.